It’s a family affair on the new music concert, Sting: Live at the Olympia Paris, as seasoned musician Sting and his musicians made a sold-out stop on their 57th & 9th World Tour at the historic Olympia music hall (a.k.a. L’Olympia) in Paris, France. The Olympia, co-founded by Joseph Oller and Charles Zidler, who co-created the Moulin Rouge, makes for a perfect venue, as Sting showcases his impressive song catalog from his solo career and the Police for the sold-out crowd. The performers include longtime Sting guitarist Dominic Miller, guitarist Rufus Miller (Dominic’s son), accordionist Percy Cardona, drummer Josh Freese, and backup vocalist Joe Sumner (Sting’s son). This family duo gets a great showcase on the heartfelt “Shape of My Heart,” and Sting introduces everyone in French to the crowd. Members of the Texas-based band The Last Bandoleros (Jerry Fuentes and Diego Navaira (the son of Tejano superstar Emilio Navaira)) also join the mix on backing vocals/percussion and backing vocals, respectively, with guitarist Derek James and drummer/vocalist Emilio Navaira joining The Last Bandoleros for their bonus set. All these musicians create a perfect performance with impressive musicianship. Sting’s artistic craftsmanship provides an outstanding anchor to showcase these talented musicians. The sound on this DVD does the music justice in LPCM 2.0 stereo and DTS-HD Master Audio 5.1 surround. Viewers see several fan reactions, which enhances the experience. The great editing is smooth but maybe a bit short at times, with no more than a five-second cut. The 1.78:1 aspect ratio wraps the fans right into the experience, especially in the shots from the back of the band facing towards the audience. 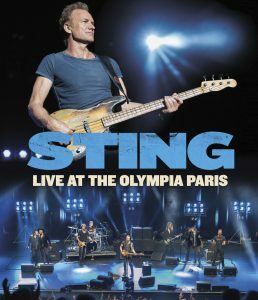 Eagle Vision’s Sting: Live at the Olympia Paris was filmed on April 13, 2017. Sting and his talented musicians played several songs from his recent 57th & 9th album, including “I Can’t Stop Thinking About You” after a fast-paced, energetic beginning with “Synchronicity II,” “Spirits in the Material World” (from 1981’s Ghost in the Machine) and “Englishman in New York” in a 23-song set. Following “I Can’t Stop…” is another 57th & 9th song, “One Fine Day,” then the upbeat “She’s Too Good for Me” from 1993 Ten Summoner’s Tales and the country-flavored “I Hung My Head” (later covered by Johnny Cash). Classics like “Fields of Gold,” “Every Breath You Take,” “Desert Rose,” “Walking on the Moon,” and “Message in a Bottle” strengthen the set and are well-placed to sustain the energy. Next is a great set from 57th & 9th: “Petrol Head,” “Down, Down, Down,” “Pretty Young Soldier,” and the great anthem “50,000.” “Ashes to Ashes” gives homage to David Bowie and is followed by the reggae-infused Police classic, “So Lonely.” The band then combines The Police’s breakout 1978 single “Roxanne” with “Ain’t No Sunshine,” originally sung by Bill Withers in 1971. The Police staple “Next to You” follows, while the set-ending “Fragile” impresses as an iconic song on its own, but it’s amazing that Sting still creates such a strong vocal performance at the end of a 23-song set. The bonus content includes nine extra “opening act” performances – one from Sting with his son Joe plus three from Joe and five from The Last Bandoleros. Subtitles are available in Italian, Spanish, Portuguese, English, Dutch, French, and German. Sting: Live at the Olympia Paris is an outstanding 102-minute main performance with bonuses totaling 137 minutes, making it a premiere music concert experience! It’s also available on Blu-ray and digital download. This entry was posted in Music Reviews and tagged concert, concert DVD, Dominic Miller, Joe Sumner, Michael Siebenaler, Mike Siebenaler, Music, music DVD, Olympia, Paris, Sting, Tall Writer, The Last Bandoleros. Bookmark the permalink.